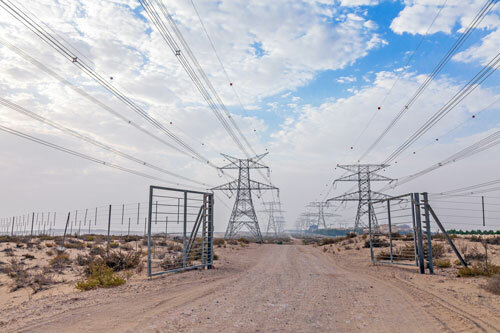 Whenever buried pipelines and overhead High Voltage AC transmission systems share a common right of way there is a potential concern with AC interference—the electrical interaction of the two systems—and the adverse impact that it might have on the pipeline. 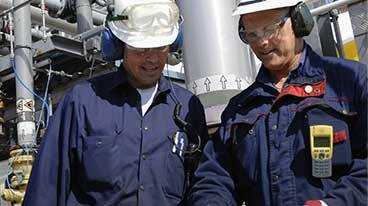 There are two key interaction modes between AC transmission systems and buried pipelines. The first mode of interaction that may cause AC interference occurs when there is a significant failure of the AC transmission tower that generates a short and very intense fault current. The current is dissipated either in part or in total into the ground in the vicinity of the pipeline sharing the right of way. 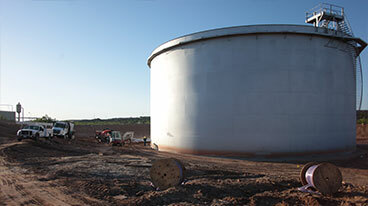 This is a rare occurrence; however, it can cause significant damage to the pipeline coating or in extreme cases may cause direct arcing of current through the soil to the pipeline itself. Arcing current can quickly damage the pipeline causing rapid excitation of the metal itself, burning a hole in the pipeline. The second mode of interaction that may cause AC interference is known as inductive coupling. This involves a phenomenon that is common in the industrial world. Indeed, all induction motors operate on this principal, as do all transformers. Basically, whenever current flows in a conductor, an electrical field is generated. If there is another conductor in that electrical field, an induced current is generated in the opposite direction to the flow in the primary conductor. This induced current is manifested along the pipeline as Induced AC voltage. For many decades, pipeline operators have been trained to look for high AC voltage pickup along their pipelines. Typically anything above 15 VAC is deemed to be a safety risk for personnel working on or around above ground pipeline structures such as valve stations. As current is induced on the pipeline, or in the event of a fault condition, a voltage gradient can occur around the above ground structures such that touching or even standing near these structures could result in electrical shock or worse. The industry standard for AC mitigation is to maintain voltage gradient below the 15 VAC threshold. Historically, high levels of AC induced voltage was considered to only be a risk to personnel and was not deemed a risk to the pipeline integrity itself. But this has proven to be invalid for many of today’s pipelines as a new risk has been found – the risk of AC induced corrosion. Almost unheard of fifteen years ago, this risk is now generating the attention of pipeline operators and corrosion professionals around the globe. Why has this changed – what is the sudden interest in AC interference and AC induced corrosion on pipelines? Historically, pipelines in shared right of ways with overhead AC transmission lines were primarily concerned with reducing AC voltage. Even those pipelines with long collocations and significant induced AC levels experienced no corrosion related problems. What we have learned is that coating quality is a critical factor when it comes to AC induced corrosion. The AC corrosion phenomenon has been largely limited to newer pipelines with high quality coatings. Research on corrosion rates have determined that at lower AC current densities there is negligible AC corrosion (consistent with older coating systems with larger holidays) whereas with higher AC current densities the corrosion rate is significant depending on a variety of other factors. 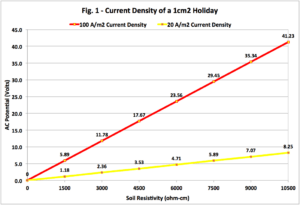 Given that corrosion can be expected at current densities above 100 A/m2 and that corrosion may exist between 20 A/m2 and 100 A/m2, it is possible to develop a corrosion risk chart based on holiday size and soil resistivity as shown in Figure 1. The upper line shows the maximum allowable AC potential along the pipeline where corrosion can be expected. The lower yellow line shows the minimal allowable AC potential to ensure that there is no corrosion risk. In between the two lines corrosion may be a risk. What this chart shows is that pipelines with induced AC voltage and good quality coatings are at risk for significant external corrosion often at AC levels well below the 15V AC threshold that has historically been used as a benchmark value for personnel safety considerations. With low resistivity soil environments, corrosion can be a risk at much lower steady state AC values. This is a predictable risk that should be addressed by the pipeline operator. As the chart above shows, AC interference can cause corrosion on well-coated pipelines at AC induced voltage levels as low as 3 or 4 VAC in low resistivity soils. Questions about AC Interference or AC Mitigation? Please contact us at the link below. Our experts are happy to help.